← Musings on Primer Pockets – How Obsessive Can We Get Really? So, you’ve spend all that time obsessing over your primer pockets, Decapping, Reaming, Cleaning (maybe), Uniforming (maybe), and now you need to fill all those empty spaces in your life. Welcome to priming! Reloading is a terrific extension of the shooting hobby, and it is a relatively safe extension, but there are several areas in which care is called for. Primers and their handling are the first. 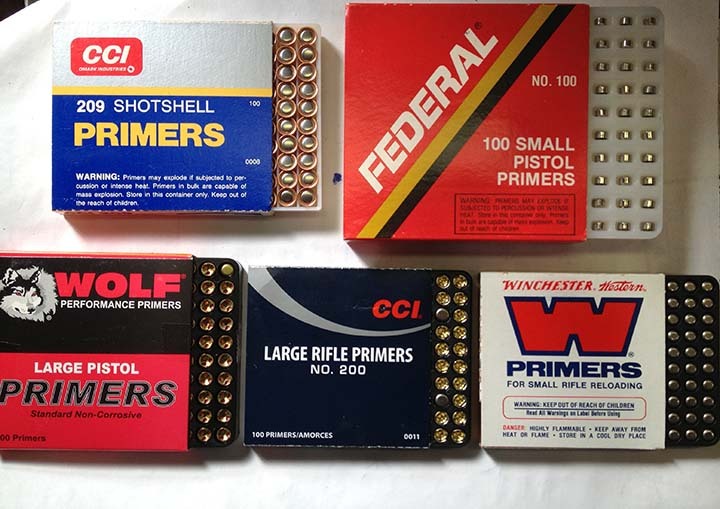 Primers are manufactured for use in specific types of cartridges, Large Rifle, Small Rifle, Large Pistol, Small Pistol, and Shotgun types. NONE OF THEM ARE INTERCHANGEABLE!! Inspected visually, it would appear as though the Large Pistol and Large Rifle varieties (same with small) would fit into the primer pockets interchangeably, THEY ARE NOT THE SAME and this should not be attempted. They vary in both depth and energy. Do Not swap Rifle and Pistol varieties! DON’T DO IT! Primers come in various sizes and types. They are designed for very specific uses, do not interchange them! Designed to detonate upon the impact of the firing pin, primers are by their very intent capable of mass detonation, especially if they are stored improperly. They are designed to go bang, but you want that to happen ONLY when YOU want it to! Unless they are actively being seated, primers should be stored ONLY in their original container. All priming devices should be kept clean and free of any accumulation of primer dust. Primers should NEVER be forced. crushed, or stuck by anything. Avoid exposing them to oil or bore solvents. Never decap a live primer. Always use eye protection when handling or seating primers. Another area of care is contamination. Avoid touching them, exposing them to any oil, solvent, or other contaminants. Gun oil, bore solvent, and even the oil from your fingers can render them dead or cause them to hang fire. Lastly, never decap a live primer. If you need to deconstruct a load, or a primed case that you later decide not to complete, take that casing and fire the primer in the firearm suitable for that caliber cartridge. In doing so, please exercise APPROPRIATE LIVE FIRE PRECAUTIONS! Once the primer has been expended, it can then be decapped. 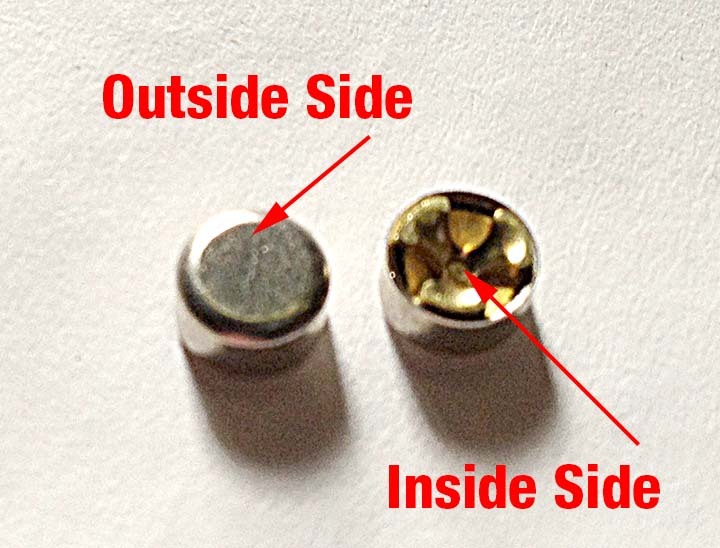 If by chance you experience a cartridge that fails to fire (it’s gonna happen trust me), you can use a kinetic bullet puller to separate the bullet and powder from the cartridge. Once the cartridge is disassembled, you can then attempt to fire the primer as outlined above. If this fails, then simply take the casing with primer still in place and drop some oil or bore solvent into the case. This will deactivate the primer and allow the case to be discarded safely. Regardless of the method of priming, we have to orient all the primers correctly. They have an inside-side, and an outside-side. We want the inside facing the flash hole in the case and the outside side facing out. Yes it is readily apparent which is which and yes it is possible to seat a primer incorrectly. This would not be good, so we must pay attention to what we are doing here. The Inside side and Outside side of primers are different one faces in and the other out. Guess how it works. Primers are generally supplied in trays which separate each primer, typically oriented upward or downward facing, some times they even are packed on their side. So in all cases, the first thing we need to do is to dump the approximate number of primers we will be using (in groups of one hundred or less) onto a primer sorting tray. Poor choice of words here – don’t dump ’em! Best to slide off the sleeve, place the primer tray on top of primers in their carrier, and then, holding the primer carrier against the tray, flip them 180 degrees. Then remove the carrier. This will neatly deposit the primers onto the primer tray, rather than the floor. Primer Trays have ridges embossed into them to help orient the primers by catching their edges and flipping them over. Gently shake the tray back and forth to orient the primers. 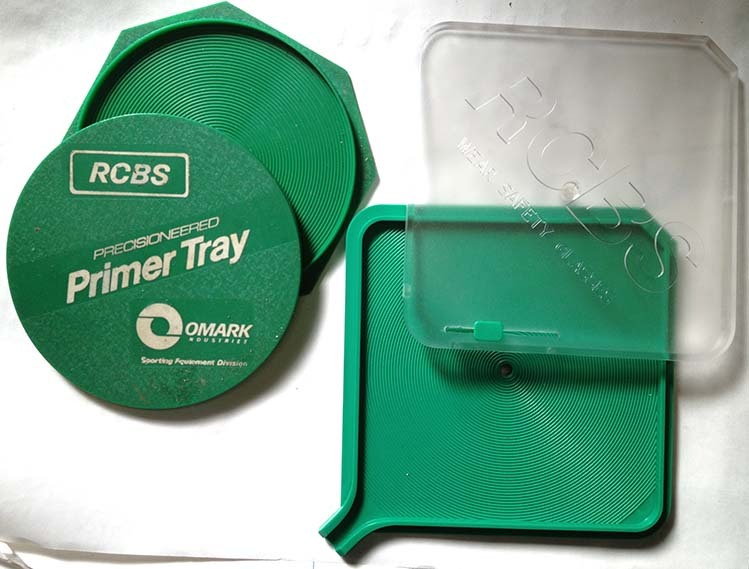 Primer Trays are devices which are built with ridges embossed into them which will “catch” the inside edge of the primer and cause it to flip “inside up.” The “outside edge” of the primer is curved and will not “catch.” By shaking the tray alternately right to left, and toward your belly and away, or by shaking it in a rotating fashion, you will orient the primers with the inside facing up. After checking to see that ALL primers in the tray are facing up, cover the tray with the provided cover. If you get one or two that simply refuse to flip, you can use a knife or a pencil to gently flip the recalcitrant little buggers. Some Primers simply refuse to flip, in that case use a knife or ruler to get those last few. Once all the primers are inside-side up, regardless of the method moving forward, you will seat the cover on the tray. Now this can be tricky as depending upon how sticky the fit is, you can actually upset some of the primers and they will flip wrong side up. This is why the covers for the hand primer are clear. So, check to determine that none of the primers have turned turtle on you (on the primer tray for the press you will check this as you pick up primers in the dispensing tube). Cover the primer tray, filled with properly oriented primers, using the appropriate cover. If you are hand priming, you can now insert the tray into your hand priming tool and get ready to move on. Hand priming tools have dedicated primer sorting trays which also serve as feeders for the tool. Hand priming tools are available in either, Universal, or Case Holder styles. They are also equipped to handle both large and small diameter primers, but you have to change parts to accommodate the style of primer you are using, follow the instructions of the manufacturer! Oriented primers are gravity fed into the body of the primer, a case is inserted under the jaws, and the handle squeezed to seat the primer. The Universal style uses spring loaded case retention clips. The case holder variety uses the same case holders that you have for your press. In both types, one simply slides a case into the tool (with the rim or extraction groove under the spring clips or into the case holder just like on your press) and squeeze the handle, feeling for the primer to seat, or bottom. Slide out the primed case, inverting and inspecting it as you do so, add a new one and repeat! A properly seated primer should fully bottom in the primer pocket, flush with the case bottom and retain its rounded cup like shape, not flattened! While you are priming your cases, get into the habit of checking the seating depth of the primer. You want the primers fully seated, but not flattened by too much seating pressure. The primers should appear to have rounded edges abutting the edge of the primer pocket. Primers should NOT PROTRUDE out of the base of the case. If they do, you stand the potential for a slam fire. Meaning that the cartridge could fire on the impact of the bolt as it is closing. This can result in catastrophic failure of the case, and/or firearm. This is best avoided! You can easily check the seating depth while using a hand priming tool, by simply “sweeping” your pinkie finger across the bottom of the case as you remove it. You will readily feel any deviation from the norm. Checking the seating depth in a press setup requires removal of the case from the shell holder to perform either visual or tactile inspection. You will eventually develop a “feel” for the priming operation which will allow you to identify unusual primer seating forces, indicating cases which require closer inspection. Again, never use excessive force to seat a primer. There should be some resistance, but ultimately it should seat smoothly once it starts. Reloading presses that seat primers are fed by primer feed tubes. This view of one shows the end with the cotter pin. Both progressive and single stage presses, which allow priming in the press, utilize primer tubes. These allow the primers to be fed by gravity into the seating device of the press, but first these tubes need to be charged with primers. Remember the tray of primers you covered earlier? Since we are charging a priming tube, we will need to flip the tray. This is best done with the cover in place, as failure to do this will require many hours on the floor searching for that last spilled live primer. (Having the little bugger picked up in the power nozzle of the vacuum can lead to unpleasantness on the domestic scene.) Once the tray is flipped, with the cover in place, the primers will now (hopefully) all be facing outside side up. Remove the ridged tray leaving the primers in the smooth tray and pick up your primer tube. Inspect the primer tube and determine which end has the half-moon spring clip and which has the spring cotter pin. Assuring that the cotter pin is firmly in place, take the tube in your hand with the half-moon spring clip down. Place this end of the tube over a primer and push down. You should have a nice reward in the form of a click and after some initial resistance the tube will slip over the primer. (It’s weird I know but I actually love this part) Repeat until all the primers in the tray have been picked up. Soon you will realize that it is much easier to take only the required number of primers for the reloading session that you require. Putting unused primers away is a pain in the neck. But NEVER leave primers in a priming tube! Always empty the tubes, returning any unused primers to their original containers. Using the half-moon clip end of the primer feed tube, push down over each primer until all the primers have been picked up. Now, recheck to make certain that the cotter pin is in place and flip the tube end for end, the “top of the tube” should now be the end with the half moon clip. Look into the tube. Chances are you will see the last primer still held in place by the half-moon clip. Take your finger nail and slip it under the end of the clip and pull out. This will allow that last primer to fall down with the rest of its buddies. Then insert the tube into priming assembly on the press where appropriate. The last primer picked up typically remains stuck in the half-moon clip. Simply hook your nail under the end of the clip and release it. At this point, making certain that the priming arm is in place and that you are ready to begin priming cases, remove the cotter pin. Primers should be heard rattling as they slide down the tube to engage the primer pick up device. Occasionally they can be heard rattling down the tube and cascading to the floor if you have not properly checked the press set up. This is to be avoided! Make certain that the “R” clip is in place, and insert the filled primer feed tube into the press. Once firmly seated, remove the “R” clip. You can use your single stage press as a priming tool in a priming only mode if you wish, or you can use it as a “prime on resizing” mode of operation. In this case you are using your press much like a Hand Priming tool. Raise the ram slightly, and side a case into the shell holder. Pull toward you on the primer seating arm picking up a primer from the Primer Tube, and raise the ram further. Press the primer seating arm away from you, fitting it into the groove in the ram. Pull the primer arm toward you to pick up a primer from the feed tube, then push it away into the groove in the ram to seat it. Lower the ram. You will feel the ram as it contacts the bottom of the case. Continue lowering the ram, to pull the case down over the primer on the tip of the primer seating arm. You should feel the primer slip into the pocket, and then a sort of a “chunk” when the primer seats. Raise the arm, slide the case off, and repeat! To actually seat the primer, raise the ram enough to push the primer arm into the groove in the ram. Then lower the ram to seat the primer as described. You can, if you wish to, prime your cases as part of your resizing operation. After you have fully resized the case, as you are sliding the ram down to extract the case from the die, pull the primer pick up arm toward you and pick up a new primer. Position the ram to allow the primer seating arm to fit into the groove in the ram and lower the case onto the primer as described above. Remove the primed case and insert a fired case to resized and prime, repeat as required. This works best in cases which do not require greater force to be applied to the press handle. Translated into English, this means smaller caliber, pistol and neck only resizing. If you are re-stuffing big bore high power cases using full length resizing, your best bet is priming as a separate operation. Your fingers will thank you for it! The two issues associated with the prime on resize approach are, you do not have a good opportunity to inspect the cases after resizing without removing and then replacing them in the press. Further, you can not perform any primer pocket associated obsessions (cleaning uniforming, etc). Additionally, you can not do this with military cases until the second reloading as you need to have removed the crimp first. With rifle cartridges, which you will likely have lubed, (carbide dies do not require lube, but these are primarily pistol dies) you will have to complete the loading with the lube on the cases and clean the lube off them manually after they are reloaded. It is not safe to tumble primed cases or loaded cartridges to remove lube. That being said, for short runs such as pressure series or a small lot of a little used caliber, this is an option. Because of the large mechanical advantage of your reloading press, it is very easy to exert excessive force and crush or deform primers. Be certain to check all primers for proper seating and the absence of deformities prior to loading further. I use Dillon spray lube, which is simply lanolin dissolved in isopropyl alcohol. After completing the loading of a small batch primed in the press, I use a rag moistened with isopropyl (rubbing) alcohol and wipe down the cases. It evaporates immediately cleaning lube from the cases nicely. This also allows a final inspection of the loaded cartridges prior to placing them into inventory. This entry was posted in Reloading for the Rifle!, The Arts of the Fusilier and tagged AMMUNITION, cartridge, cartridge preparation, hand load, RELOADING, riflery, Shooting. Bookmark the permalink.